VDust Plus. Liquid cleaner for sensor. If you are unsure as to the nature of a stain on the sensor of your camera or you get both water and light lubricant stains, VDust Plus™ will fit the bill perfectly. Designed to clean away water and most oil stains, VDust Plus™ eliminates streaking and provides a moderate static barrier. 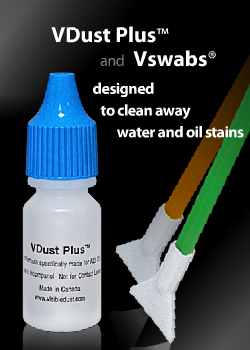 VDust Plus™ Formula solution. VisibleDust liquid cleaners (Sensor Clean, VDust Plus and Smear Away) when used with VisibleDust Sensor Cleaning swabs are safe and effective on all digital cameras including: Canon, such as the 400D, 40D, 1D MKIII, and 1Ds MKIII, Nikon D300 and D3 and Alpha Sony 700.